Is Everything You Read About Global Warming Fact or Fiction? I’m sure you have heard that global warming is the number one culprit for: flooding, droughts, unusual weather patterns, sea levels rising, these are all head liners in news papers these days and blamed on the inhabitants of our planet Earth but is global warming fact or fiction? As big industry carries on spewing out smoke from high stacks, vehicles exhausts fumes are improving but the numbers are getting ever larger, fossil fuel burners, and so on and so on, but are the perceived dangers truly a reality? 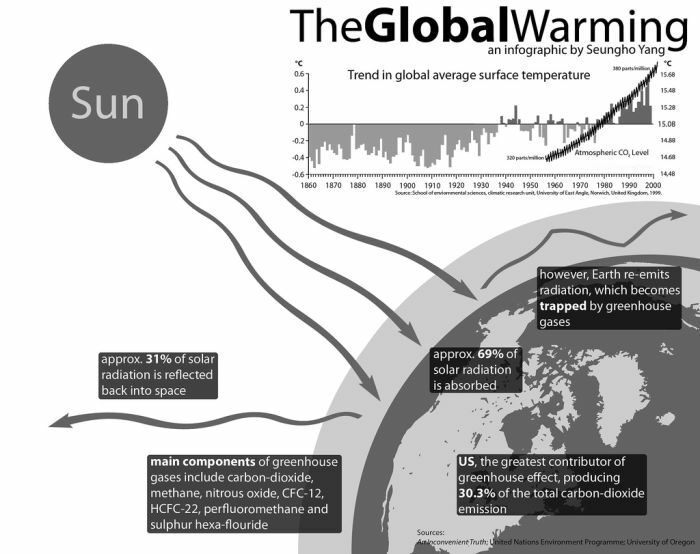 Global warming refers to recent global climate change that the IPCC has attributed to measured increasing levels of Atmospheric CO2 from Human activity. IPCC is the acronym for the Intergovernmental Panel on Climate Change, founded in 1988 by the United Nations. The effects of carbon emissions seem to be the elephant in the room in our world. We are all aware of the abuses of our environment and yet we do not compromise our lifestyles. Damage control would cost money, regulating carbon emissions to an effective degree would cost money, and who would want to deplete their pocketbook; certainly not most big businesses. So I ask, how worthwhile is the pursuit of wealth if your children’s children will not benefit from it? Is wealth truly so pleasurable at the expensive of mankind? Plus it can trigger lots of changes in ocean bio geochemistry; all of these affect the functioning of a society. Global warming also has an enormous impact with respect to melting glaciers and ice sheets. Higher global temperatures melt glaciers such as the one in Greenland, which flow into the oceans, adding to the amount of seawater. A large rise (on the order of several feet) in global sea levels poses many threats. Global warming conspiracy theorists typically allege that, through worldwide acts of professional and criminal misconduct, the science behind global warming has been invented or distorted for ideological or financial reasons, or both. Global warming also affects weather patterns as they pertain to cyclones. Scientists have found that although there have been fewer cyclones than in the past, the intensity of each cyclone has increased. A simplified definition of what global warming means for the planet is that colder regions would get warmer and warmer regions would get much warmer. However, there is also speculation that the complete opposite could be true. A warmer earth could serve to moderate temperatures worldwide. There is still much that is not understood about the earth’s climate, because it is very difficult to make climate models. As such, predicting the effects that global warming might have on our planet is still an inexact science. Global warming effects on Earth affect many things like animals, plants, weather, glacier, humans, economy and many other things. The Earth’s average temperature for each year of the last decade has been in the top 25 high temperatures of all time. Indeed, 1998 and 2005 the warmest year in the history of the Earth. The planet is getting warmer every day, and only because the change is gradual, we cannot ignore the fact that we are vulnerable to the threat of global warming. The consequence of global warming and its effects on Earth is legion. Many animal species are disappearing from the planet due to loss of habitat caused by global warming. Even plants have not been spared from suffering the effects of global warming on earth. Since the drastic temperature levels, different species of plants have had difficulty adapting to the area where once flourished. Rising temperatures will lead to negative effects of the weather. Even minor changes in global temperatures will trigger a series of extreme weather and changing weather patterns around the world. One of the worst effects of global warming on Earth is a long term time and permanent ice cover on the planet. The evidence for global warming due to human influence has been recognized by the national science academies of all the major industrialized countries. No scientific body of national or international standing maintains a formal opinion dissenting from the summary conclusions of the IPCC. Top Secret Carbon Credit Brokering Program That Teaches Individuals How To Profit From The Carbon Credit And Global Warming Craze. Product Has Little Competition And Is In High Demand. Lots Of Satisfied Customers. In simple terms, global warming refers to an overabundance of carbon dioxide in our atmosphere. This carbon dioxide traps heat and acts like a blanket warming the earth. Humans are contributing to the excess amounts of carbon dioxide present in our atmosphere in many ways. The current debate on global warming isn’t so much whether it exists, as to what is natural and what is not. If man did not exist on Planet Earth, would global warming exist? Perhaps if we all had a clearer idea about the effects on our daily lives, we would try to do more about global warming. I hope you have found this article – Global Warming Fact or Fiction – informative, and you will share your own experiences below in the comment box and please take the time to click on the share button, many thanks; see more articles on The Daily Green Post home page.